‘Zorro: Sacrilege’ will launch in February. While other heroes might be celebrating their 30th, 50th or even 80th anniversaries in 2019 — Hi, Batman! — one masked do-gooder has even more years on the beat, with a century of crimefighting under his belt. Next year sees the 100-year anniversary of Zorro, and independent publisher American Mythology Comics has announced plans to celebrate the milestone. 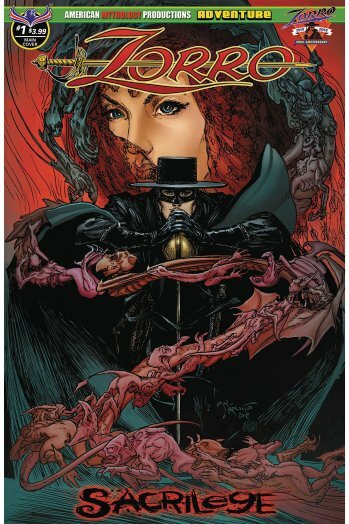 Zorro: Sacrilege will arrive in February, written by American Mythology editor-in-chief Mike Wolfer, with art by Mauricio Melo; covers for the series will come from Melo; Roy Allan Martinez; and comics legend Michael Kaluta, who will supply the main cover for the series’ first issue. In the new series, Wolfer teased, “Something darker and more ancient than Christianity [is] preying upon the people of San Leticia.” What could that be? He’s not saying, but he did suggest that “fans of Dario Argento’s films” would like what’s to come. Zorro — the masked identity of Don Diego de la Vega — debuted in 1919’s The Curse of Capistrano, a novel by Johnston McCulley that was serialized across five issues of pulp magazine All-Story Weekly. That story was adapted a year later as The Mark of Zorro, co-written and starring Douglas Fairbanks, leading to McCulley resurrecting the character in 1922 and going on to write more than 60 stories featuring the character. Since then, Zorro has featured in prose, movies, comic books, video games, TV shows and even stage plays. The character is widely considered to be one of the inspirations for the creation of DC Entertainment’s Batman.